A stunning bouquet of White Parrot Tulips and Aspidistra. This luxury bouquet of flowers contrasts the oppulence of White Parrot Tulips with the traditional uniformity of Aspidistra. Categories: Mother's Day Flowers, Spring Flowers, Sympathy Tributes. Elegant White Parrot Tulips and Aspidistra make up this stunning bouquet of luxury flowers. We only use the finest quality freshly cut Parrot Tulips and Aspidistra in this luxury bouquet. Parrot Tulips have very large heads and petals that are feathered or wavy, giving this flower a truly distinct look. The over-sized heads of the Parrot Tulips help to give this bouquet a flamboyant, yet elegant feel. Our florists offset the elegance of the Parrot Tulips with Aspidistra foliage to perfectly balance this bouquet. The old-fashioned, tough, leathery Aspidistra foliage contrasts beautifully with the stunning flamboyance of the Parrot Tulips. A little known fact about Parrot Tulips is that the name Parrot Tulip actually comes from the fact that these over-sized, ivory-white ruffled blooms look like parrot feathers. Please note, if a flower pictured is unavailable for any reason, we will substitute this for a flower of the same or higher monetary value that is a similar style and colour. As with all natural products there may be slight variations in colour to the flowers which are pictured. If you have specific requirements for your bouquet, please call us on 020 7351 7996 to let us know and we will be happy to help. When you receive your bouquet, we recommend cutting the stems and displaying them in fresh water, in a cool room out of direct sunlight. 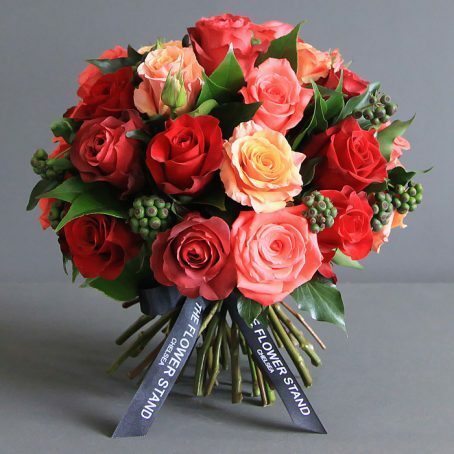 Our same day flower delivery service throughout central London is second to none. For orders received by 7pm (6pm on Sundays) we can deliver flowers to all London residential postcodes on the same day, 7 days a week. Charges are automatically calculated on checkout. We guarantee timely delivery or the cost of your flowers will be refunded. We only use our own vehicles when delivering and our drivers are very experienced and conscientious. Same day delivery can be possible later than 7pm, but it depends on our driver availability. Please call 020 7351 7996 to check if ordering after 7pm and you require same day delivery in London. Due to difficulties accessing offices outside of hours, we require orders to be placed by 3pm to guarantee same day delivery to London business addresses. This service is not available on weekends. Order one of our luxury bouquets online anytime day or night and nominate a specific delivery date, any day of the week. Delivery charges will be automatically calculated on checkout for central and greater London postcodes. Perfect for organising Mother's Day flowers, birthday flowers, anniversary bouquets or flowers for Valentine's Day. A stunning bouquet of Roses that is hand-tied at our Chelsea florists using the finest quality Mixed Ecuadorian Roses and Seasonal Foliage. A beautifully refreshing bouquet of white flowers, combining white Lisy, white Stocks and white Astilbe. 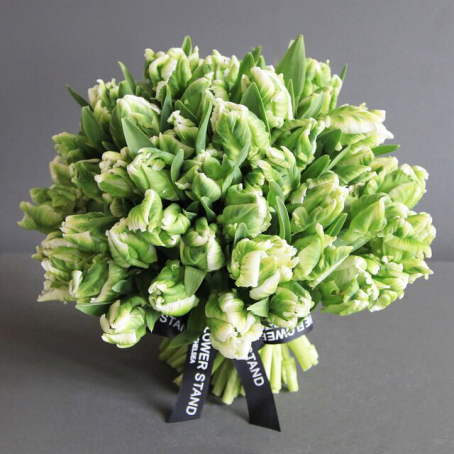 Our expert florists hand tie your bouquet preparing every stem ready for delivery on your specified day. Pink Tulips, Avalanche Sorbet Roses, Pink Veronica and Pink Bouvardia hand-tied into a luxurious Tulip and Rose Posy. 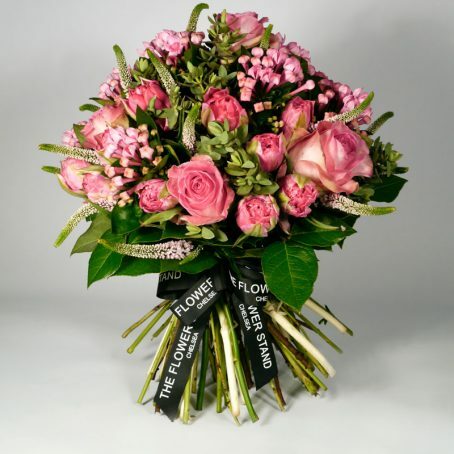 The finest quality cut flowers are chosen by our Chelsea florists to create this stunning bouquet of luxury flowers. Luxury bouquet of Tulips. 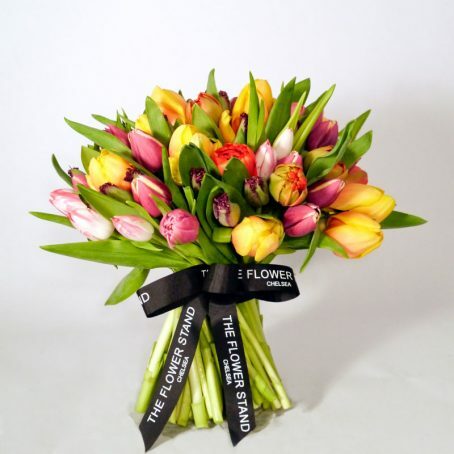 Classically beautiful Tulips arranged into a stunning bouquet by our expert florists. A vibrant, floral design, combining an array of Tulip colours offset by green foliage. Same day flower delivery for central London orders received by 7pm (6pm on Sundays), 7 days a week. Nominated day flower delivery for central and greater London postcodes. Order any time day or night. If you can't see the right bouquet, we have a huge range of flowers, so please call us on 020 7351 7996 to arrange a custom bouquet.